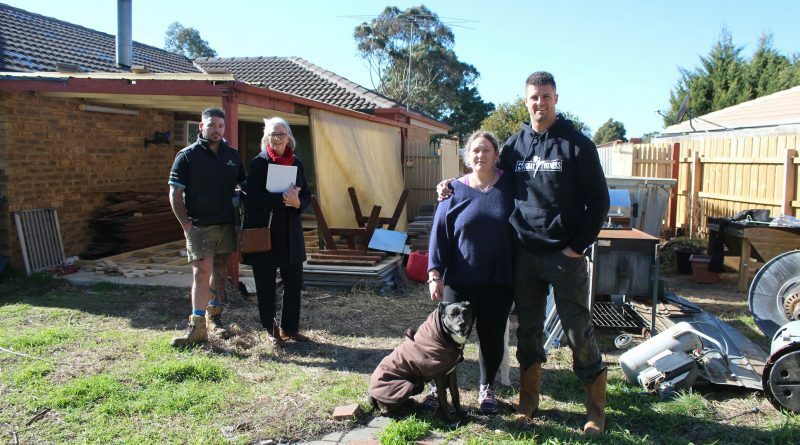 From left: Luke Mills of Next Level Property Maintenance, Erica Gray from Reece Plumbing Sunbury, disability pensioner Nikki Anticevic and David Cannon with David's dog Jazz. Underneath David Cannon’s tattoos and behind his boxing gloves lies a real softie at heart. 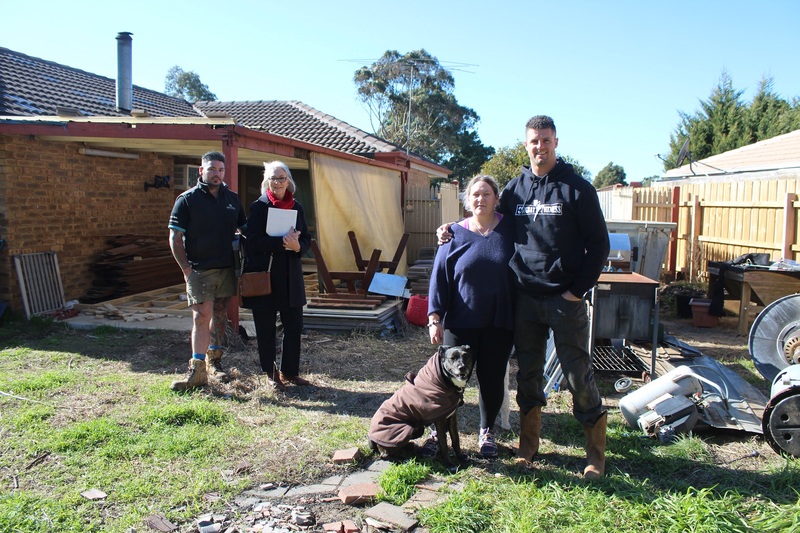 The Sunbury gym owner and competitive boxer has embarked on a ‘pay it forward’ home renovation for a Romsey woman doing it tough. David met Nikki Anticevic, a disability pensioner, after responding to an advertisement for a caravan she had put up for sale. The van wasn’t for him but when he learned why she was selling it he was moved to come to her rescue. Nikki showed David through her home and he saw a disaster zone of unfinished renovations, a kitchen with no lighting and a rotting bathroom. When he learned she suffered from fibromyalgia, depression and chronic fatigue syndrome, David got back in his car determined to do something to help Nikki. “Her story touched me and made me realise that as a community we should come together to help a person in need,” he said. David recorded a video and posted it to Facebook calling on his mates to lend a hand with a home renovation. The emotional post soon went viral and offers of labour and materials began to flood in. Reece Plumbing in Sunbury offered bathroom fittings and tapware, and David’s friend Luke and other tradesmen volunteered their time. “I probably received over 500 messages of people offering support and donations,” David said. “It was only meant to be something small – getting a few lengths of timber here and doing a patch job – but it’s created something massive. “For me it warms me up a little bit because it shows that we all actually care about each other. Nikki said David came along at just the right time in her life. “He’s a godsend for me, he really is,” she said. Maybe it’s the fact that David has overcome significant hardships of his own – temporary paraplegia and a spinal fusion two years ago – that makes him so empathetic to others in need. “A lot of people helped me through that, so I don’t relate to having my house pulled apart but in terms of having struggles in your life this really touched me,” he said. The project team will be holding a series of working bees at the property with the first on August 10. Anyone who’d like to lend a hand or make a contribution can contact David through the ‘Romsey Home Rescue’ Facebook and Go Fund Me pages. Any funds left over after the renovations are completed will be donated to a homeless charity. 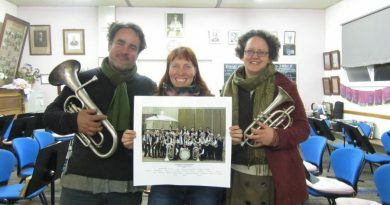 Foundry Band musicians Mark Anstey and Alison Hanley and filmmaker Leonie Van Eyk with a photograph of the local band. 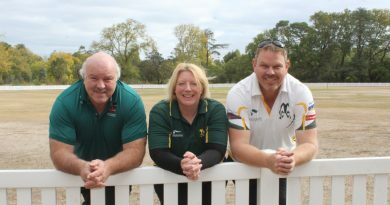 Gisborne and District Cricket Association president Rob McIntyre, Malmsbury Cricket Club president Jenny Ganim and Chris Ganim. 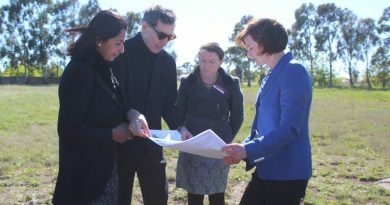 Rationale founder Richard Parker, Rationale CEO Shamini Rajarethnam, Macedon Ranges Mayor Jennifer Anderson and Member for Macedon Mary-Anne Thomas discussed plans for the new site.